Twentieth century Russian wristwatches are too costly for many native buyers, but they are still inexpensive for Western Collectors, and are becoming extremely popular. Watch faces commemorate all the great moments of Russian and Soviet history-from Yuri Gagarin's space flight to the Summit meeting between Gorbachev and George Bush-and celebrate Russian culture with images of native costumes from Chechnya to the Ukraine.Collectors have long clamored for a definitive reference and this new book will satisfy even the most avid enthusiast, with photographs of over 500 watches manufactured in Russia and the USSR during the second half of this century, and explanations of their styles, workings, and manufacturers. Poljot, Wostok, and Slava wristwatches are covered, along with a sampling of pocket watches, deck watches, and marine chronometers. 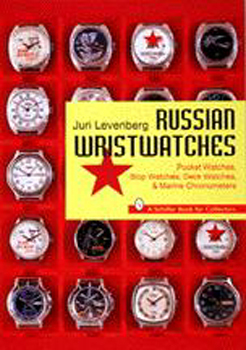 This book is a must for serious collectors in the growing field of Russian timekeepers.